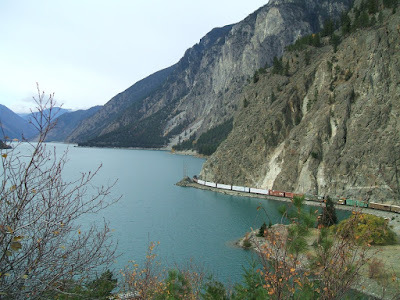 We Love RV'ing: Cayoosh Creek from Seton Lake to Lillooet, B.C. We’ve been RV’ing in the Lillooet, B.C. area for several days now and have seen some incredible scenery. Lillooet, pop. approx 2500, has all the necessary shopping facilities, restaurants and more, so it makes a great place to park the RV in one of the local RV parks, especially if you have a larger one. 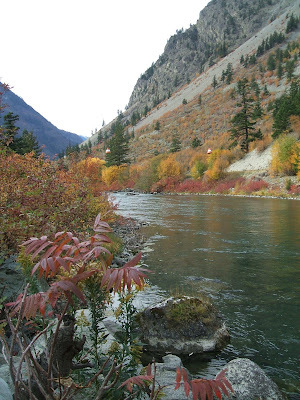 Lillooet, BC is the hub of Hwy’s 99,#40 and #12 so a perfect location to start your day from. 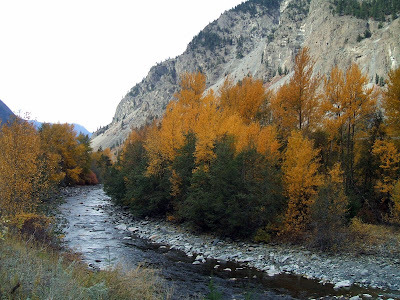 Following Hwy 99 southwest from Lillooet, the road follows alongside Cayoosh Creek and offers some beautiful fall colors to enjoy along the banks of the creek in October. Lillooet has been our home base and we’ve taken day trips to see the rest. There is so much to enjoy in this part of the Circle Tour – Lower Mainland and one has to be here to appreciate how beautiful it really is. Summer might offer the best weather but shoulder seasons could be wonderful, too. Our timing was chosen due to work but the fall is such an exciting time to get nature’s changing colors and so I was excited about the possibilities. Gyro Park is beside the road with lots of room to park your RV while you enjoy listening to the babble of the creek and admire the scenery. This one does not have camping facilities but we’ve seen several campgrounds on our daytrips, many of them look more appropriate for camping with smaller vehicles or tents. Most of them are government campgrounds and so you can check with their online information for availability if you’re planning on using them. 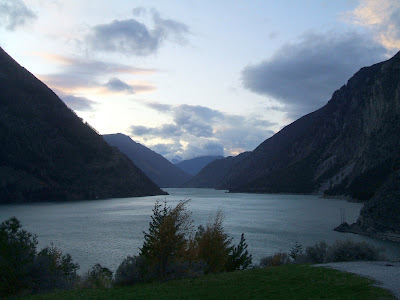 A very nice one is only 6 km (3.5 mi) out of Lillooet at the Seton Lake Reservoir Recreational area. There are 45 campsites, many under the trees to offer shade and cool in the summer months. The first time I saw Seton Lake with it’s turquoise water and majestic surroundings, it reminded me of Lake Louise, Alta., which I’d first seen many years ago and have never forgotten. No matter what season it is, it is a beautiful sight, although the color varies with the season and the light. Seton Lake is 243.8 M.(800 ft) above sea level and is 27 km (17 mi) long. The area has 3 private campgrounds and a free 60 site campground. During the summer months, the sandy beaches offer great access to swimming, canoeing, kayaking or water-skiing. Sailboats might especially enjoy the lake with the wind that often comes up. Fishing offers rainbow trout and mountain whitefish. Seton Lake was once a major transportation route by boat for all local people from one end to the other. This changed once the railroad was chiselled out of the banks along the lakeside. I couldn’t help but notice the serene lake as the train took the scenic trip on its way to deliver the goods it carried. It is amazing to think of the changes that took place in a relatively short span of time in our history.